Searching for remote Alaskan fishing lodges? We guarantee that a luxurious stay at one of the Alaska Sportsman’s Lodges will be a most amazing memory-making adventure a select few will ever get the chance to experience. Our guests walk away with more than just a photo album bursting with pictures of brown bears and trophy salmon; they walk away with legendary fishing tales that they can swap with even the best of anglers. Our guides are experts in both fishing and bear safety, so we can ensure your safety as you fish the Kvichak River with an infamous Alaskan brown bear walking only a few feet away! Some Alaskan fishing lodges can offer unique wilderness experiences, however the Alaskan Sportsman’s Lodges provide unique and custom-made wilderness experiences that can be enjoyed in the lap of luxury. 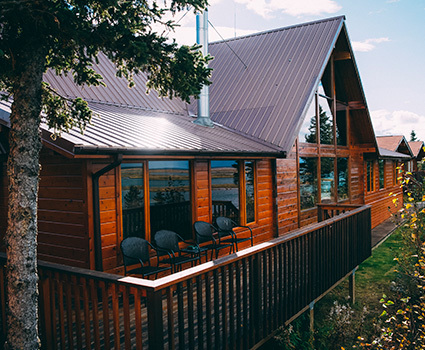 We have two luxurious lodges located on either the banks of the Kvichak River or the Naknek River. Both of these rustic Alaskan mountain castles offer 5-star services. We pride ourselves on our ability to custom design the daily adventures according to the interests and desires of our guests. These two Alaskan fishing lodges are the top choices for fishing destinations in Alaska, but our guests love to take the opportunity to pick and choose from the wide variety of daily activities and all-inclusive packages that we have to offer. Brown bear viewing is a very popular choice among our guests. We offer unique bear-viewing expeditions that result in up-close-and-personal encounters with dozens of brown bears while you fish some of the best waters in Alaska. These bears are fully intent on munching on the same trophy salmon that swarm the rivers you will be fishing, so our tours are safe and provide rare moments that only a lucky few will ever stumble upon. We have world-class guides at each of our 5-star Alaskan fishing lodges. Our guides will lead you deep into the Alaskan wilderness where solitude resides and bald eagles soar. We tell our guests to expect numerous bear sightings as they delve further into the lush forest on their way to the Kvichal River.